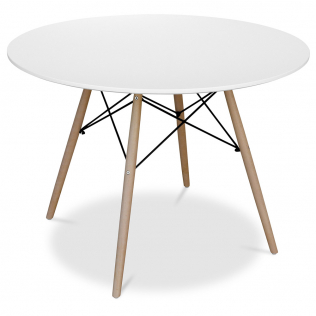 The Geneva dining table, is formed by a white wooden board 100 centimeters in diameter and 4 legs in solid beech wood, the structure is made of stainless steel. This simple but elegant table can accommodate up to 5 people. This dining table without a doubt can be combined with any style or color chair. Give your interior decor a minimalist touch with the Geneva. Today, does it again with this Geneva Table 100cm - Wood.We are helping to bring you design products that cannot be found elsewhere at cost prices directly from factories in Asia. Our team is always on the lookout for unique, top quality products and we are stepping up our efforts to bring you choice and quality at cost prices, products that will charm you with their design, their originality and their price!